SHENZHEN, China, Nov 27, 2018 (SEND2PRESS NEWSWIRE) -- With a qualified team of experts since 2003, Wondershare has had many breakthroughs in the technology industry. Their tools come in handy for different operations. They have recently announced another flagship software that will help retrieve lost data from dead hard drives. This comes after decades of research and applied ingenuity in the field to develop the software. 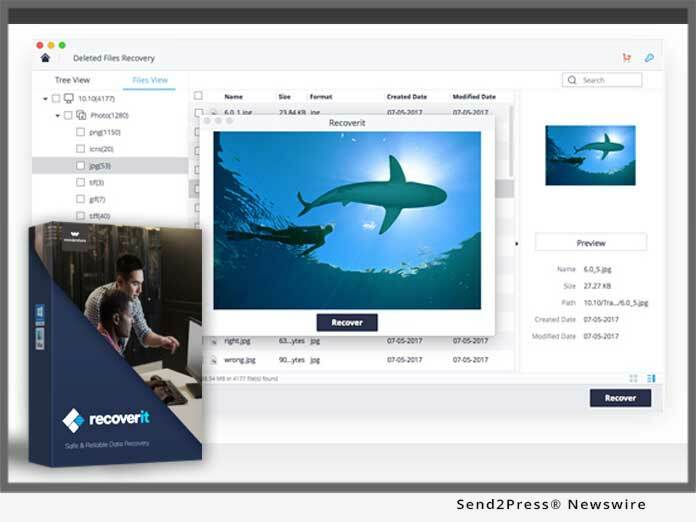 The software being talked about is the Wondershare Recoverit software that will help users recover their data. What does Wondershare Recoverit do? Recoverit, with a 96-percent recovery rate, is deemed one of the best. With much consideration put into the design, ease of use and general application it can be clearly seen that the company is doing its best to stay ahead of cases related to data loss. The data recovery software is compatible with Mac as well as Windows. Recovering data from a dead hard drive can be accomplished easily with Recoverit due to its user-friendly GUI. The software is built to serve an everyday computer user as well as anyone any tech-savvy user. In order to get the latest version of the software, simply visit their official website. Recovering data from a damaged hard disk is a two-step process, whereby you select the hard disk with the issue and then perform a scan to find the lost data. Damaged hard drive recovery ( https://recoverit.wondershare.com/recover-data-from-a-damaged-hard-drive.html ) is that simple with the Recoverit. So, what makes Recoverit the ultimate data recovery software? First of all, it has many fascinating aspects when it comes to its use and there are many elements that drive this software for the user to have an exceptional experience. * High-Performing and Powerful: This is one of the most powerful data recovery software available. It can scan huge lots of data without crashing and figure out what data is to be recovered. It can perform simultaneous scans to find the lost data and thus, files can be recovered from the formatted drive in a matter of seconds. * Advanced Scanning Algorithm: The software has been designed with an algorithm that makes scanning the dead, formatted or damaged hard drives easy. It is a fast and powerful data analyzer that will even perform deep scans, resulting in a high recovery rate. Recoverit starts with a free trial version so that users can get to experience the software in action. With other subscription packages offered, there is a money back guarantee. With the free version, users can recover files from the formatted hard drive free and that is what sets the software apart from any other recovery tool. It for its awesome features has got over 5 million users across the globe. As stated by Tobee Wu Founder and CEO Wondershare Technology, the software giant believes in creating a simpler world by using better technology each day.